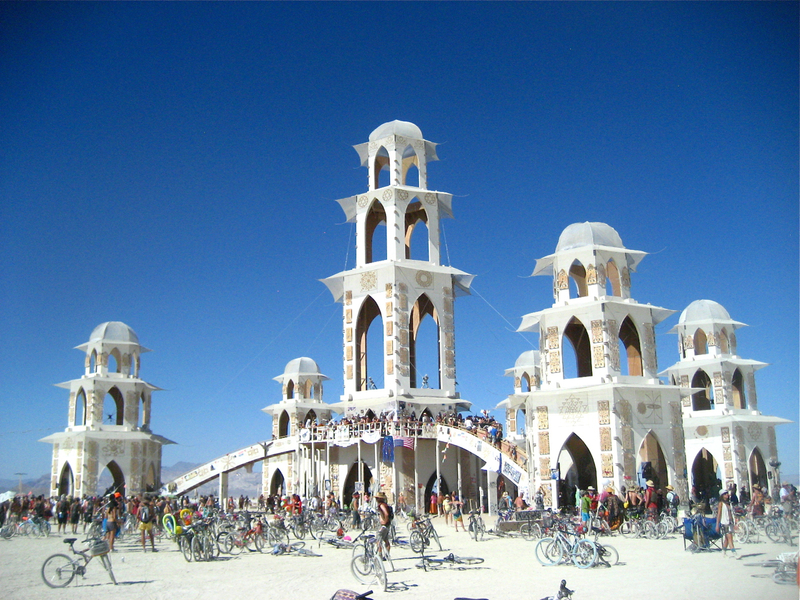 First-timers think Burning Man is about a burning man. I guess you can’t blame them. We thought that as well when we first attended in 2007. Then, after the man burned on Saturday and everyone went crazy (note to readers: with 11-yr old kid in tow in 2007, our “craziness” was measured in glow sticks and excited exclamations), we stuck around on the Sunday, finally checked out the interior of the Temple, and returned to the Playa watch it burn that night – the art cars all with their lights dimmed, tens of thousands of people in respectful silence but for the sound of human anguish. It was one of the most emotional experiences of my life. The temple burn was ruined on our second year due to frat boy weekend warriors who decided to sing “The Banana Boat Song” throughout; we had to leave early Sunday morning and miss the temple burn on our third year, so as to get a free ride back to Reno. 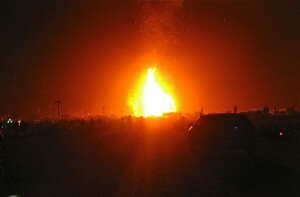 Being able to stick about for the temple burn this year, and the fact that the ceremony was respectful again (at least where we were parked), helped make this year complete for us. How beautiful is this? Please click on the image above to see at a larger size. A brief snippet of the gamelon music inside the temple. Apologies: you will have to turn your head sideways to fully appreciate it. 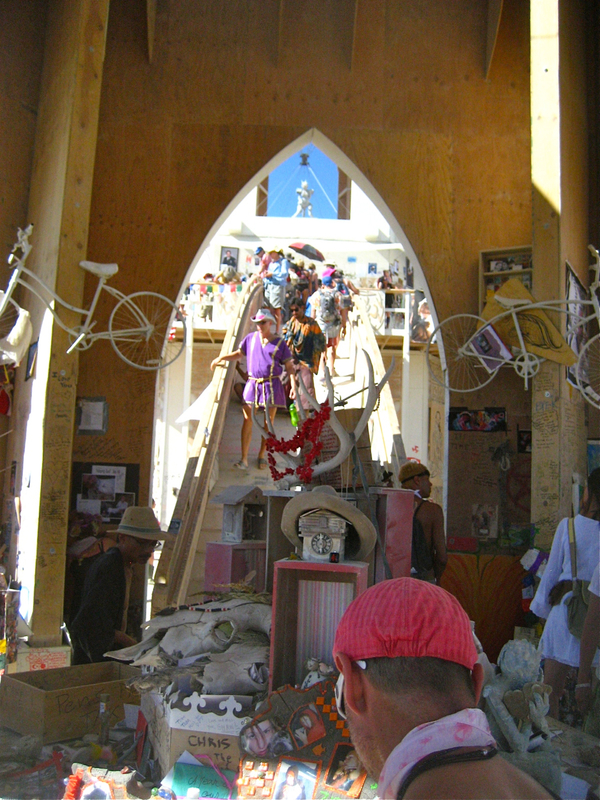 Every year, the Temple offers Burners a chance to pay respects to those who have recently passed, to leave notes, pictures, mementos, or merely memories – and it offers the chance to do so in solace, and in peace and quiet, even as it is constantly crowded and buzzing. 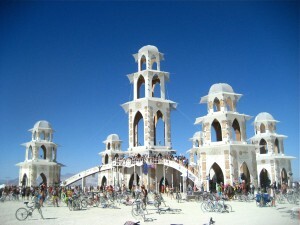 (Believe me, contradictions come together at Burning Man.) Every year, the Temple is one of the most beautiful structures you will ever experience (using all senses). But this year, the Temple of Transition truly surpassed its predecessors. 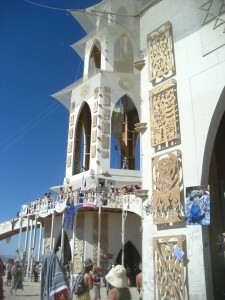 Its absolute and pure beauty – the magical presence it cast across the Playa throughout the week – had much to do with the unaninmously high opinion of this year’s event. More detail of the towers, and an interior shot of the main tower, showing some of the mementos left behind. And then it burned, in all of fifteen minutes, from top to bottom, taking all those memories and mementos, all that labour and devotion, and turning them into ashes. It was beautiful, and I hope my Kidsville friends who had lost parents in the last year and had extra reason to appreciate the Temple this year, gained some peace from the process. To those who built it, brought it and burned: (May your) God bless you for doing so. The Temple Burn, Sunday September 4, as seen from the distance. Please click on thumb-nails for larger images. 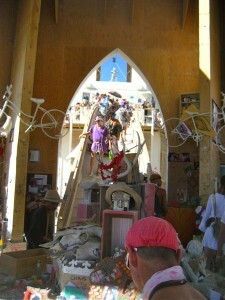 A search on You Tube for “Temple of Transition 2011” will elicit all sorts of musical and visual wonders.